England coach Sven-Goran Eriksson has told an undercover reporter he would quit if England win the World Cup this summer, says the News of the World. 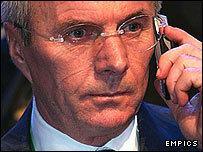 Eriksson is also quoted suggesting he would be prepared to become manager of Aston Villa as part of a takeover. The Football Association refused to comment on the article, which also featured claims attributed to Eriksson about David Beckham and Michael Owen. Eriksson's agent Athol Still called the article "disgraceful entrapment". An FA spokesman said: "We want to reflect on the article in full before we make any formal comment." Eriksson, who is under contract as England coach until 2008, was on an FA-sanctioned trip to Dubai when he is said to have been contacted by an undercover reporter who said he wanted to discuss a coaching job at a new football academy in Dubai. He is said to have told the reporter that Aston Villa was for sale, that England captain David Beckham would return to play in England if Eriksson asked him to, and that striker Michael Owen was not happy at Newcastle. As well as saying he would leave the England job if they won in Germany this summer, he is also reported to have said he would like to be paid as much as Chelsea manager Jose Mourinho, the top earner in the Premiership. Still says there were never any negotiations and described many of the claims as "sheer fantasy". "The people we spoke to seemed totally plausible," he said. "Following the discussions the people we spoke to said they had a substantial sum of money to invest in a Premiership club. "I mentioned Aston Villa and Sunderland. The rest of the conversation was sheer fantasy. "At no point did Sven say he would not honour his contract with England - he has even talked with me about extending it to 2010. "He did talk about possibly managing Aston Villa because you never know what will happen in football, but it was all hypothetical. "There were never any negotiations, it was all just fantasising. "Sven is really angry that they have done this in a World Cup year. I will have to read the article fully before considering whether we will take any further action." The reporter in question, Mazher Mahmood, has a track record of trapping public figures in embarrassing stings. Among other celebrities caught out by the "Fake Sheikh" are England rugby star Lawrence Dallaglio and the Countess of Wessex.